Since it began, the fight against the Dakota Access oil pipeline has always existed in two separate, but related arenas: The actual courtroom, and the court of public opinion. 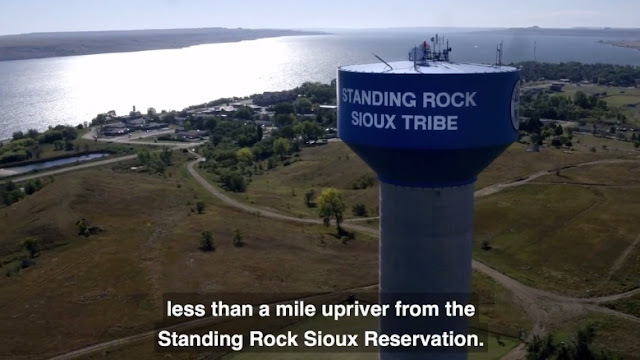 This week, NoDAPL activists at the Lakota Law Project released what is perhaps the most direct appeal to that second arena to date: A short, emotionally stirring TV commercial that highlights not only the potential environmental risks posed by the oil pipeline, but the blatant hypocrisy of those who argued to move its path away from a city at the expense of the neighboring Standing Rock tribe. Attorney Chase Iron Eyes—a longtime Standing Rock advocate and onetime candidate for the U.S. House of Representatives—explains in the ad that the goal is not the total shutdown of the pipeline itself (at least, not yet), but rather a temporary halt until a full environmental impact study can be completed. Our spot made its debut on television during this morning’s news shows in Washington, D.C., and our march on Friday will put the exclamation point on its message. Please join us in keeping the eyes of the world on Standing Rock. Nevertheless, the path ahead for anti-pipeline activists is not an easy one. President Trump—a vocal supporter of the project—has already walked back Obama administration efforts to stop the pipeline’s construction pending further studies. And just this week, a federal judge tossed an injunction filed by Standing Rock lawyers against the pipeline’s continued construction. Still, Iron Eyes and other Standing Rock activists are ready for the long fight ahead. “This struggle remains the true, timely intersection of environmental justice and the preservation of our inherent human rights,” Iron Eyes wrote in his statement. Responses to "Standing Rock activists just released their first, brutally effective NoDAPL TV commercial"